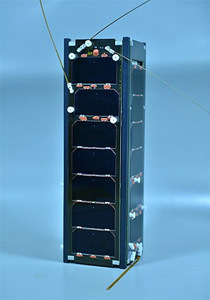 TurkSat-3USat is a communication 3U-cubesat built by the Istanbul Technical University (ITÜ), Istanbul, Turkey as a follow-up project to ITÜ-pSat 1. The payload of the TurkSat is a VHF/UHF transponder to be used for voice communication. Additionally, a small camera is also included. A deorbiting system is also designed to deorbit the satellite following its end-of-life to comply with the current CubeSat standard and United Nations regulations. The nanosatellite has sufficient volume for all the systems with full redundancy. Both in-house developed systems based on COTS components and readily available commercial CubeSat systems are used together to achieve redundancy.